In today’s extremely competitive market property and store managers cannot afford the tarnished image caused by cutting back on exterior grounds maintenance. Regular sweeping is a very important component contributing to overall outside appearance and parking lot maintenance. Sweeping parking areas on a regular basis could bring more revenue to businesses. The outside parking areas are where business owners hope their potential customers will derive an initially favorable ‘first impression’. Well maintained parking areas and sidewalks are key to attracting customers. Studies show that cleanliness ranks as one of the top factors in determining where people shop or lease. Regular sweeping develops and retains the desired competitive edge for a business’ exterior by allowing patrons to focus on landscaping and signage rather than clutter and debris. Storm water runoff is fast becoming a factor in our environment. Sweeping your parking area on a regular basis can help to minimize pollutants in your storm water stream. By keeping the exterior of the store clean you’re helping prevent your customers from tracking dirt inside as well. Both factors help create a cleaner, safer, healthier environment for you, your employees and customers alike. Sand, dirt and other trash are abrasive and therefore harmful to asphalt. They will shorten the life of pavement, as well as the service time of any seal coating, striping, crack repair concrete etc. When debris such as dirt, sand or glass is allowed to stay on pavement, it quickly starts deteriorating the pavement materials and altering its potential life expectancy. This is why sweeping is the first key component to any parking lot maintenance program. Replacement costs for pavement far exceeds the routine expense of sweeping. 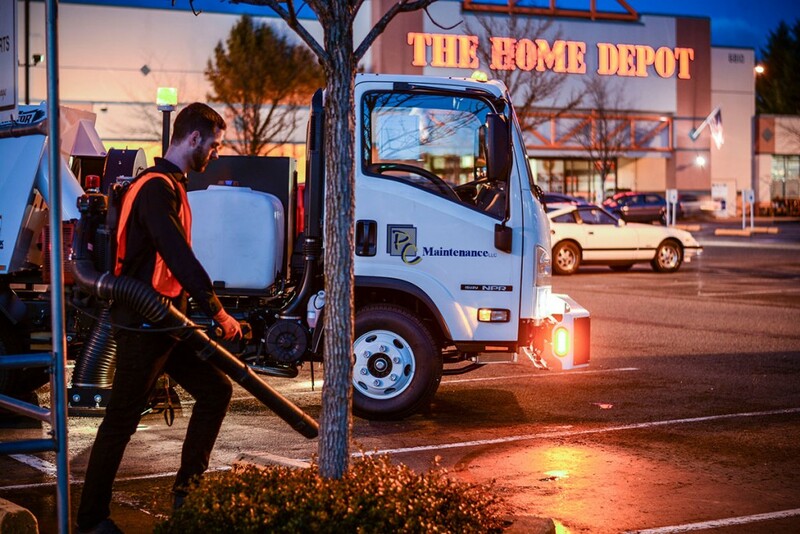 If there is a high traffic flow, your lot will need to be swept more often than a specialty store with only a few customers per day. The more obstacles there are to work around, the more expensive the service will be. If you have center islands filled with rocks or bark – this material will work its way onto your lot. The leaves and other debris from trees are considered when bidding on your lot. If your parking area has a noise restriction, there will only be limited times to work in your area. Even if there is not a noise restriction, there may be other factors that limit sweeping time, for example a bar that is open until 2:00am or a coffee shop that opens at 6:00am. Sweeping contractors are not responsible for slip-and-fall accidents. These machines will keep your lot looking neat and tidy, but they will only be on site for a limited time. Something can spill, leak or blow into the area after the lot has been swept.